On the edge of a beautiful nature park, near beautiful towns such as Ronda, Marbella and the Costa del Sol, there is an intimate, cosy and family friendly holiday park. You enjoy on this park of peace, nature, scenic views and Spanish culture. The beautiful houses and apartments at the Spanish holiday complex are located on the outskirts of Sierra de las Nieves natural park in Andalusia. Close to all amenities and facilities, surrounded by nature with infinitely many bird species. In the nearby river you will see turtles and frogs. A holiday in this park is ideal for nature lovers. It's also an ideal place for a family vacation. Children have a lot of space on the four acres of grounds with a swimming pool and a children's playground with trampoline. Group holidays are also possible. The holiday complex is "the place to be" in Spain for horseback riding weeks, yoga weeks or holidays for wheelchair users. The area surrounding the domain is beautiful. Cities and villages such as Malaga, Granada, Marbella, Ronda, Tolox, Alozaina, Monda and Yunquera are within a driving distance of the complex. In total there are 7 accommodation facilities for guests devided over apartments and cosy cottages with a total capacity of 36 people. Next to the complex there are still additional plots including an area with a permit to build a hotel with 65 rooms (3,500, 00m2). Furthermore this complex offers a pool, various terraces and corners and the necessary equipment. This is an ideal Holiday Complex to manage in the south of Spain. More information upon request. Celebrating holidays on this Spanish holiday complex is not only enjoy the apartments, the peace and nature. There is much to experience. You bored no time. For example, on the site of an old mill from the 15th century there is also a miller's cottage. Search turtles in the Creek below the complex. Or follow the flow and here you can also enjoy the rugged nature, an orchestra of the birds or the beautiful fruit trees. Around the domain you will discover very special bird species. The holiday complex is therefore very suitable as address for bird lovers. Prefer a day of rest? Then go relax by the pool. The complex is also a great base to discover an important region of Spain. 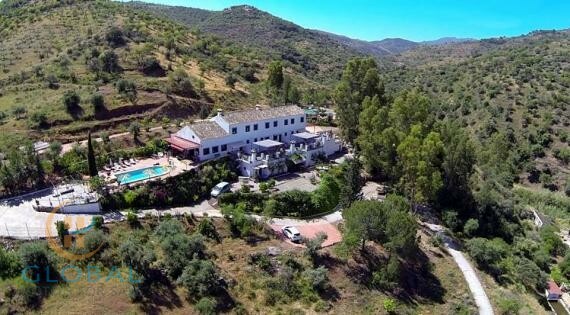 Directly in the surrounding area you will find beautiful nature and many beautiful towns and villages such as: Marbella, Malaga, Ronda, Tolox and even more. The surrounding area is ideal for holiday, even if you, in addition to the authentic natural beauty of the surroundings, need of culture or shopping. The places Malaga, Marbella, Ronda, Guaro, Monda, Coin, Tolox and Alozaina, Yunquera are within driving distance and are ready to be discovered.